Declan Armour, Managing Director of Shanco, reveals the significant role of the groundworks contractor in modular construction, and explores how early engagement was the success behind two modular education projects in Oldham. Modular construction is becoming an increasingly popular option to address a range of issues associated with traditional procurement and construction in the education sector. The benefits for the customer over a traditional build can include increased quality and levels of energy efficiency, reduced construction costs and greater predictability of programme. As with any method of construction, there are some potential pitfalls, that can prevent these benefits from being fully realised, one of which can be the failure to properly consider the ground conditions and the various options for the foundations during the planning process. A good understanding of the ground conditions, and indeed the wider logistical and social considerations, is essential to ensure an efficient and robust modular project. Early engagement with a groundworks contractor experienced in modular construction can be critical to reducing risk throughout the programme. As part of a £37m school investment programme, Oldham Council required a new solution for two schools to improve facilities and meet the growing demand for school places in the area. Oldham Academy North in Royton needed additional teaching facilities, which were to be located in a 1,850m2 building on an unused area in the existing school grounds. Meanwhile, Greenfield Primary School, built in the early 20th century, no longer met the requirements of modern teaching so a new, larger 2,300m2 school building was proposed on the school’s existing playing fields. “These are two really significant and important developments for Oldham. They underpin our commitment to improving our education offering and ensuring every Oldham school is ‘Good’ or ‘Outstanding’ by 2020,” says Cllr Paul Jacques, Cabinet Member for Education and Culture. 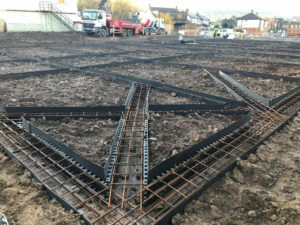 Building on an existing relationship with the appointed specialist modular contractor and Oldham Council, Shanco was engaged early in the planning stages to investigate the ground conditions at the proposed sites and to assist in developing the most suitable foundation solution. Both projects involved significant challenges. The proposal for Oldham Academy North involved constructing the modular building while the existing school remained operational and the new Greenfield School was to be constructed in a small residential village with high levels of school traffic passing through. The efficient modular installation programmes would be highly beneficial for both projects because they involved significantly less construction activity on site, which in turn involved reduced deliveries and vehicle movements as compared to a traditional build. The modular design and layout of the two school buildings also meant that best use could be made of the available land, leveraging increased value from the project budgets. The designs for the buildings were modern and attractive, achieving the look and feel of traditionally built structures with the additional quality assurance that can be delivered by constructing modules offsite in a controlled and weathertight factory environment. 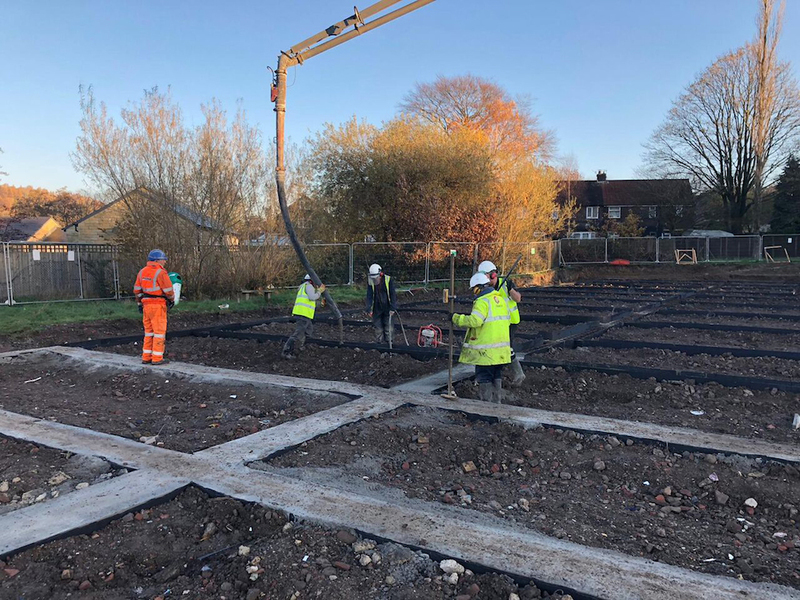 Establishing the existing ground conditions is an essential factor when determining the type and depth of foundations required to support the modular building. The existing surveys suggested that the ground consisted of clay at both sites. Clay can be problematic, as ground water tends to collect rather than drain away. Shanco undertook additional surveys to confirm these reports, taking samples from across the sites. The survey results influenced the measures needed to control surface water through the installation of a geocellular attenuation tank at the Greenfield site. Shanco worked with a specialist piling contractor to develop piling solutions that would address the restricted load bearing capacity of the clay, whilst also avoiding the scheduling, health and safety and operational implications of deep excavations. Individual site conditions at the two projects called for a different piling solution for each site. At Greenfield School, a survey of the residents who live near the site confirmed that it was important to limit the noise and vibration generated from the piling activities and for the work to be undertaken quickly to reduce disruption to the village. A Continuous Flight Auger piling option was developed, particularly suited to piling through interbedded sequences of clays, and a less disruptive alternative to driven piles. 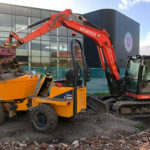 At Oldham North Academy, the piling work was scheduled to take place within the school holidays, so the effects of noise and vibration were not the leading concern. A driven, pre-cast piled option was developed, providing a cost-effective solution for the loading requirements of the smaller building. Another stumbling block for many modular builds can be the requirement for Section 278 entrance works and the compliance approvals associated with new road formations and drainage connections in the highway. Early consideration of these elements during the planning stage and an understanding of the site access requirements, the site drainage and the final new entrance requirements of the completed building, should be incorporated into the programme. An experienced groundworks contractor can anticipate the necessary information to ensure approvals are in place when needed, avoiding costly delays. 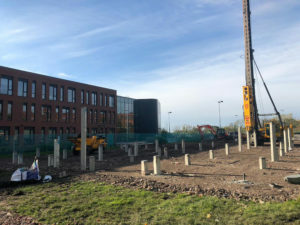 As the new modular building at Oldham Academy North was to be built within the existing school grounds, early planning meant that Shanco could help facilitate a solution before construction commenced to keep construction traffic away from the school during the project. A new access road and site entrance were to be formed through an industrial area at the south of the school to be used by delivery vehicles and site traffic. The new road had to run down a steep embankment, across a public footpath and via some protected woodland. Shanco helped the team work through the process to gain the necessary planning permissions, including contingency plans to protect the trees and to gate off the footpath, keeping it accessible yet safe for public use. This solution is an example of how the broad role of the groundworks contractor can contribute towards the safest site logistics strategy and an efficient planning process, further enhancing the benefits of the modular project for the customer.